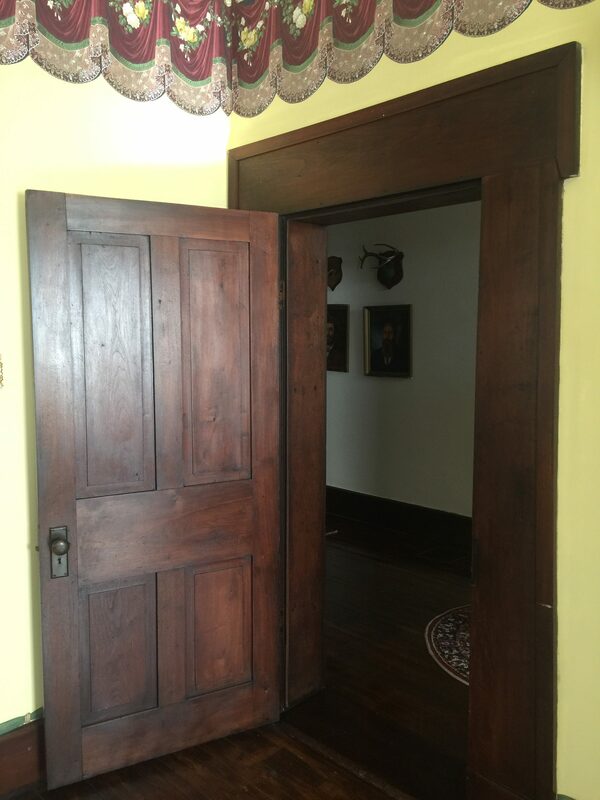 The black walnut trim found in many of our rooms are made from wood not only original to our 1849 house, but also to the property itself. The trees were growing on-site when the house was built and were milled to specification and put into the house during construction. At the time the milling of such hardwood was a relatively new technology. Adding the facts that the cut of the wood is unusually tapered and so artistically fitted might help explain how original owner Elijah-Starr Ruggles squandered much of his inherited wealth on the house and had to flee the state in debt. When Elijah-Starr Ruggles fled, the property reverted back to the original title holder, a farmer named James Evans. His family sold the house to W.J. Dent in 1911 (hence the name of the house on the National Register of Historic Places, the “Ruggles-Evans-Dent House). The family name Dent may be familiar to Missourians as the root of the name of Dent County, MO, and also the last name of Ulysses S. Grant’s wife Julia, who was W.J.’s cousin. 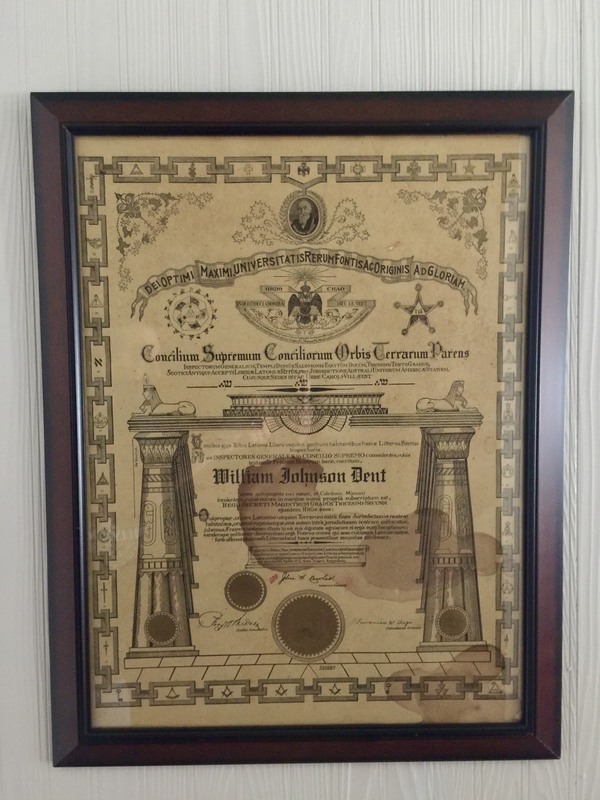 W.J.’s Masonic certificate, issued from the oldest operational Masonic Lodge west of the Mississippi here in Caledonia, was found in the house. 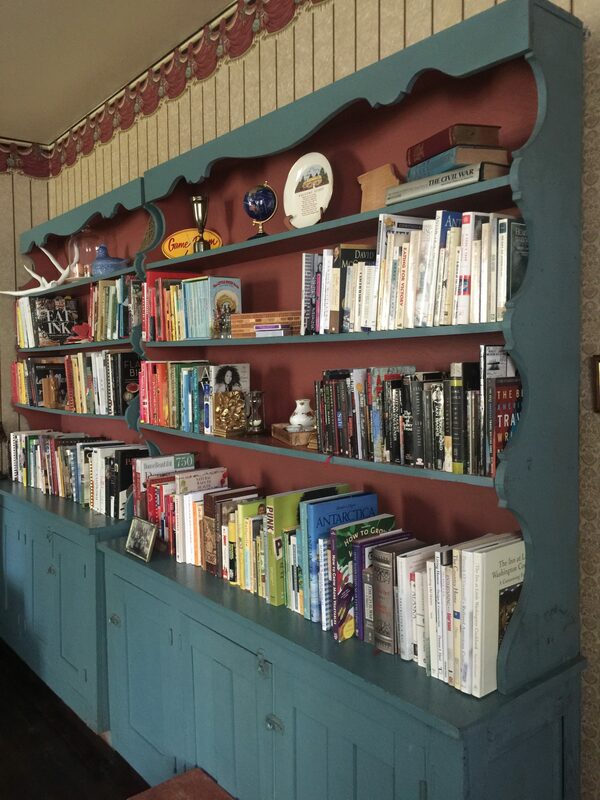 It is displayed in our Hawthorne guest room on the main level. Coincidentally, Elijah-Starr Ruggles’ father, Martin, founded that Masonic Lodge back in 1825. Martin was the brother of Comfort Ruggles, a participant in the Boston Tea Party. Martin and Comfort are both buried nearby in Caledonia’s Presbyterian Cemetery. 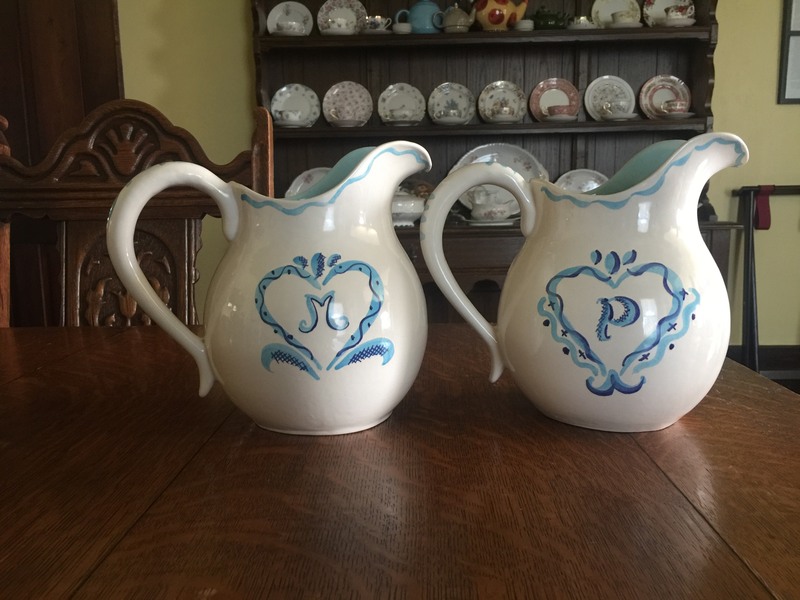 Chanticleer pottery, including two of the six in the singular “Wallen Pitcher” series, named for Mary Wallen, Old Caledonian owner/innkeeper Penny’s late aunt. We also have two of the factory’s original display cases, now used as bookshelves in our Library. Plus, and perhaps most impressively, we have a full-wall mural painted by Chanticleer co-founder and chief artist Michael Chomyk in our Keeping Room (see our featured image at the top of the page). The former display cases from Chanticleer. The Old Caledonian Bed & Breakfast is located just 15 minutes from The Battle of Pilot Knob Historic Site, a Civil War battlefield. During the Union’s retreat from Pilot Knob, which led through Caledonia, they were fired upon by their Confederate pursuers. The Ruggles-Evans-Dent House was hit by a cannonball during the retreat! Ask us and we’ll show you the repaired point of impact on the side of the house. 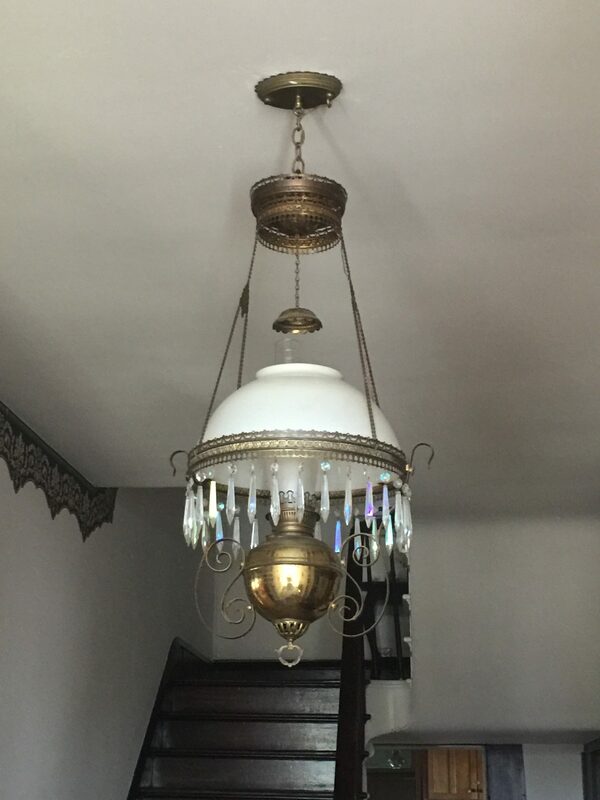 The light fixture in our foyer is one of only two original to the house. It is, of course, a converted gaslight. One of the original (converted) gaslights in the house. The other one is located in the storage room off the kitchen! The original granite carriage step can be found straight through our front gate at the edge of Highway 21. We would love for you to come experience the Old Caledonian’s historic surroundings for yourself, or on a return visit to our B&B. Cheers, and see you here in Caledonia!